Like it or loathe it, the streets of Shoreditch are getting ever higher. 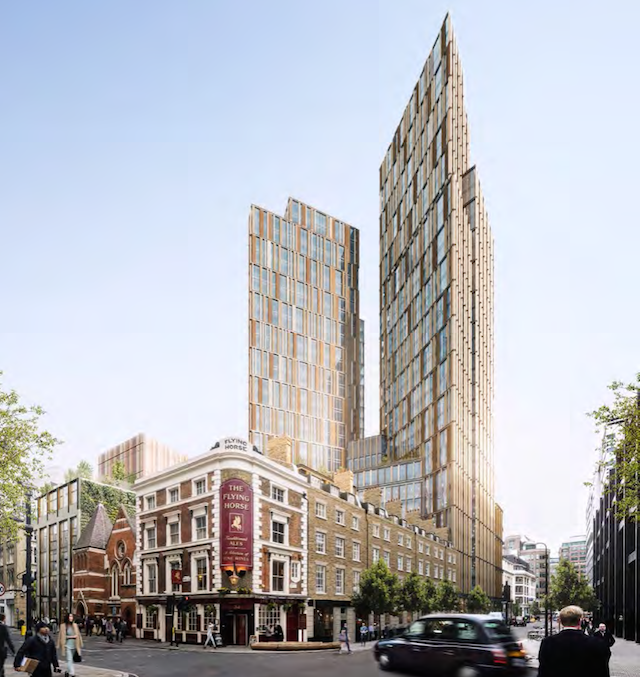 Three new proposals would see further towers on the City fringes, as the Square Mile skyline continues its inexorable creep into the Borough of Hackney. 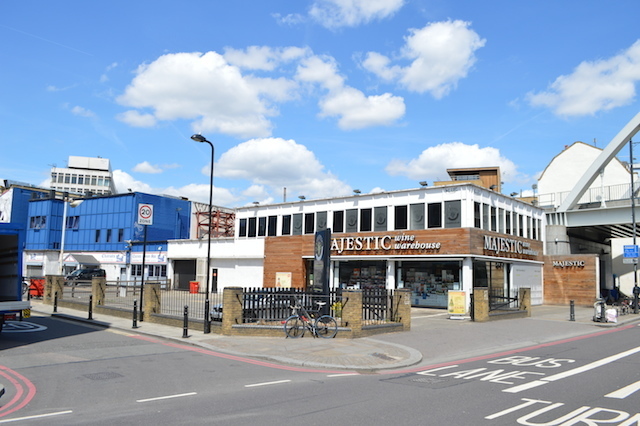 First, imagine that Boxpark is just a runty little pup, and that a big Godzilla Boxpark is coming to Shoreditch in search of her wayward offspring. 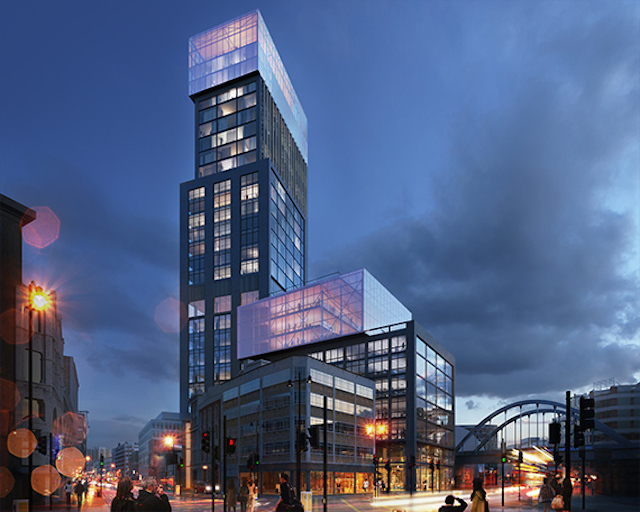 That's the impression we get from 201-207 Shoreditch High Street, a collection of mismatched boxes Jengaring 30 storeys into the sky. The 110-metre-tall scheme would stand right next to Village Underground, that oh-so-Shoreditch events venue with the tube carriages on the roof (you can just about see them poking out to the low-left of the building). It would replace Majestic wines and Chariots sauna on Fairchild Street. At this stage, the tower remains in preliminary design and has yet to be submitted as a formal planning application. If built it would include a luxury hotel and office space, as well as public realm improvements round the base. Highgate Holdings hope to begin the scheme next year, with completion in 2019. 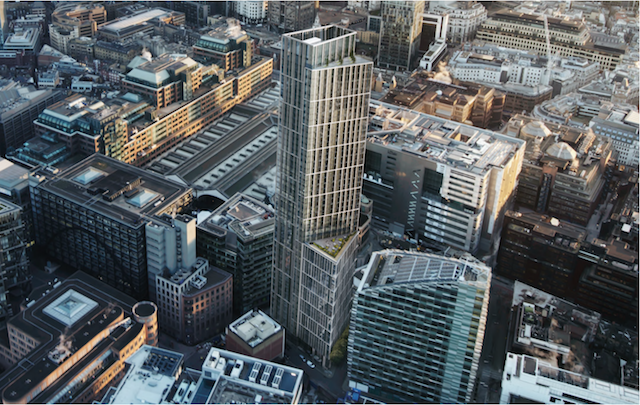 The second proposal would see development at 13-14 Appold Street, just north-west of the Broadgate complex. Here's the view looking south-east (Liverpool Street station is just behind the crown of the tower). This slender tower could reach up to 160 metres, and would be another hotel/office combo. The scheme, yet to gain planning permission, is undertaken by the not-at-all sinister-sounding Masterworks Development Corporation. It would replace Bavaria House, a 1980s block of little fame but subtle charms. The third project is perhaps a little more sympathetic with neighbouring buildings. One Crown Place would match the height of the City towers behind it, but also sport a facade whose colour scheme blends well with the older buildings of south Shoreditch — at least on this render. Not everyone will agree, but we rather like the effect of contrasting heights with complementary cladding. The reality may be more jarring, depending on the quality of materials. The almost-twin towers are designed by KPF and would reach 123 metres above ground level. It would be yet another building of mixed use, with hotel, office and retail components. The site currently contains a series of grubby, disused offices that briefly flared into the public eye in 2011, when the Occupy movement opened a 'Bank of Ideas' within. The scheme has been submitted to Hackney Council for planning permission. These buildings are just the latest in a forest of tall proposals for the Shoreditch area. The map below shows the three schemes above (red pins), plus some of the other prominent towers expected to complete in the next few years (orange). Schemes include the Principal Tower (161 metres), The Stage (115 metres) and the Bishopsgate Goodsyard development (up to 166 metres) — for comparison, the Gherkin is 180 metres — plus a bevy of new towers along City Road. There is an increasing opposition to the perceived over-development of Shoreditch, with strong campaigns against the Goodsyard, and a scheme on Blossom Street in particular. Details of the various plans for the area, and elsewhere in London, can be found on the New London Development map and are discussed on Skyscrapercity.com forums. See also our earlier piece on the Canary Wharf-isation of Shoreditch and a look at the growing number of hotels in the area.